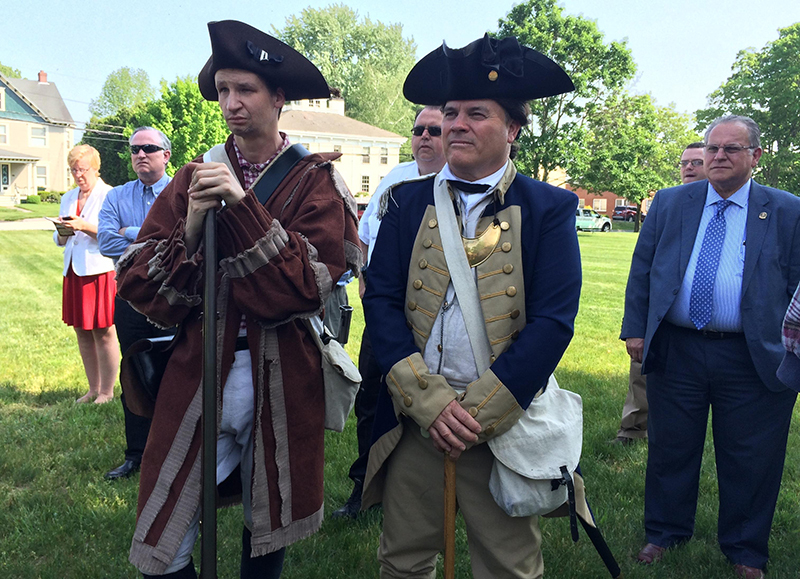 NORWICH — A visit by Benedict Arnold and performances by the Unity of Nations Mohegan Tribe Drummers on Wednesday helped the Norwich Historical Society launch two walking trails that will highlight the city’s historic past. The society celebrated the opening of the Uncas Leap Trail and the Benedict Arnold Trail, both part of a larger trail system called Walk Norwich. The Uncas Leap Trail features the Mohegan Tribe’s history in southeastern Connecticut and showcases sacred sites. The Benedict Arnold Trail explores Norwich during colonial times and the Revolutionary War. “The trails are really wonderful,” Norwich Historical Society consultant Regan Miner said. Many people who take the society’s guided tours often want to return to learn more on their own, she said. “Unfortunately before, we had to say, ‘No, we don’t have a way for you to view it afterwards, and now we do,” she said. People can now explore the trails at any time, using self-guided brochures, a website, walknorwich.org, and an audio component on the Arnold trail. “It’s very interactive and fun,” Miner said. The trails also offer seven interpretive signs at key historical sites, Miner said. All have pictures, text and maps. The society also is offering Walk Norwich fleeces for sale at the Ideal Skate Shop in Greeneville. On hand for the ceremony were several city officials and state lawmakers, including Norwich Mayor Deb Hinchey, state Sen. Cathy Osten, D-Sprague, Rep. Kevin Ryan, D-Montville, and Rep. Emmett Riley, D-Norwich. Future trails will include The Freedom Trail, which focuses on Norwich’s abolitionist and Civil War history, and the Millionaires’ Triangle, which focuses on Norwich in the Gilded Age. Kevin Titus portrayed Arnold, the notorious Norwich native who was a hero of the Continental Army before turning traitor and joining the British army in the Revolutionary War. “Believe it or not, there was a lot more to (Arnold’s) story than people realize,” Titus said. Mohegan Tribal Council Chairman Kevin Brown noted that the tribe and Norwich have a long and interconnected history in the region, citing historical Mohegan tribal chief Uncas. “Uncas recognized the importance of cooperating with the settlers so we could all continue to move forward,” he said. Historical Society President Bill Champagne thanked many who contributed to the trails project, including Miner, who served as the content editor for both the trail walks. The historical society also used Wednesday’s celebration to mark the seasonal opening of the Norwich Heritage and Regional Visitors Center, in the 1783 Dr. Daniel Lathrop Schoolhouse on the historic Norwichtown Green. The center, at 69 East Town St., is open 10 a.m. to 4 p.m. Wednesday through Sunday until Oct. 30. Self guided trail brochures may be picked up for free at The Norwich Heritage and Regional Visitors’ Center, NCDC, the Greater Norwich Area Chamber of Commerce, Otis Library, Slater Memorial Museum and Leffingwell House Museum.